Hoseinpourafrd, M., Izadi, M., Nasehi, M., Torabi-Nami, M., Zarrindast, M. (2016). Neuroprotective Plants; What, How, And Why? A Narrative Review. International Journal of Medical Reviews, 3(1), 349-353. Mohammadjavad Hoseinpourafrd; Morteza Izadi; Mohammad Nasehi; Mohammad Torabi-Nami; Mohammad-Reza Zarrindast. "Neuroprotective Plants; What, How, And Why? A Narrative Review". International Journal of Medical Reviews, 3, 1, 2016, 349-353. Hoseinpourafrd, M., Izadi, M., Nasehi, M., Torabi-Nami, M., Zarrindast, M. (2016). 'Neuroprotective Plants; What, How, And Why? 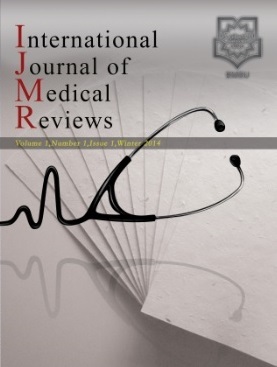 A Narrative Review', International Journal of Medical Reviews, 3(1), pp. 349-353. Hoseinpourafrd, M., Izadi, M., Nasehi, M., Torabi-Nami, M., Zarrindast, M. Neuroprotective Plants; What, How, And Why? A Narrative Review. International Journal of Medical Reviews, 2016; 3(1): 349-353. Pezeshki va Salamat: Rasekhoun; 2011. Available from: https://rasekhoon.net/article/600/. Buchbauer G, Jirovetz L, Jager W, Dietrich H, Plank C, Singh S, et al. Aromatherapy: evidence for sedative effects of the essential oil of lavender after inhalation. Z Naturforsch C. 1991;30:395-6. Asgarpanah J. Phytopharmacology and medicinal properties of Salix aegyptiaca L. African Journal of Biotechnology. 2014;11(28):7145-50. Geraci JR, Smith TG. Vitamin C in the diet of Inuit hunters from Holman, Northwest Territories. Arctic. 1979:135-9.